Description: Northbound Pigs swing onto the South Jesup Sub for the quick run to Waycross. This is Folkston before the Overpass and second Track were built. It is my first trip to Folkston and I am amazed at the number of Trains here. The Overpass will be completed in 1997, the Platform will get built in 2001, and the second main Track will be constructed late in 2003. 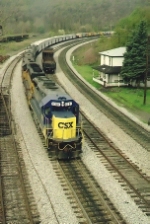 Title: CSX GP-40-2 6301 starts up the Blandon Lowgrade line with ALCS (Allentown-Chessie System). The removed track to the lower right was the Reading's Hill line which Conrail found to be too steep. Description: R-356 has almost made it to the Summit. Note: the new hoppers from Johnstown America. There was still a lot of track at Sand Patch in 1991. Description: CSX train R145 at Flomaton. CSXT 6301 was originally C&O (CS) 4403. Date of photo approximate. Description: 6301 is in charge of the CSX executive cars brought in to Augusta, Ga. for the Masters golf tournament in 1999. Description: Local power moves into North Yard. Description: CSXT Southbound Local Freight Train M719 ( Bessemer Run ) passing through 13th Street Interlocking in Birmingham, Al. Description: CSX B77510 heads south to Norwood.